Confession: I lived fifteen years of my life as a vegetarian, and I really don’t like vegetables all that much. I can, however, eat my own weight in cheese and pasta, so things worked out (though not all that healthily). In any case, I am not completely without sympathy when my 5-year-old complains about vegetables. I get it. However, when I do get excited about veggies is when they’re roasted. I believe the vegetable doesn’t exist that isn’t improved by roasting. Okay, okra, but it really should only be eaten fried. Something magical happens as vegetables roast and you end up with something crisp, a little sweet, and just heavenly. So most of our veggies are roasted, which in addition to being yummy, is a very fast and easy way to prepare them. I’ll share some more of our favorites in another post. 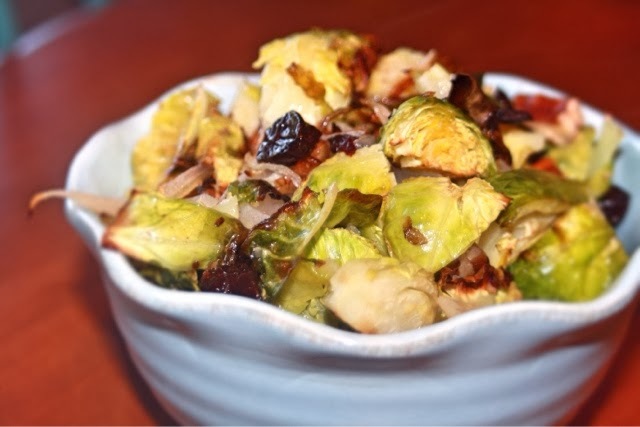 But today is my husband’s favorite: Brussels sprouts. I know. I know. But trust me. Just try it and know that if roasting can transform the maligned sprout, it can work magic on any veggie. This is adapted from a recipe that appeared in Cooking Light many years ago, and that I can no longer track down or clearly remember. I know it had some combination of dried fruits and nuts. You will start by trimming and quartering your Brussels sprouts. You can also choose to leave them halved, but they cook more quickly when quartered. The chop your pecans and slice the onions. 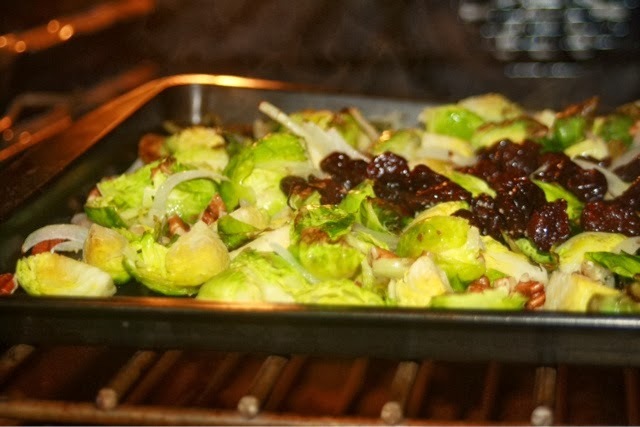 You want to get the onions really thin so that they get nicely browned during the short time the sprouts need to roast. 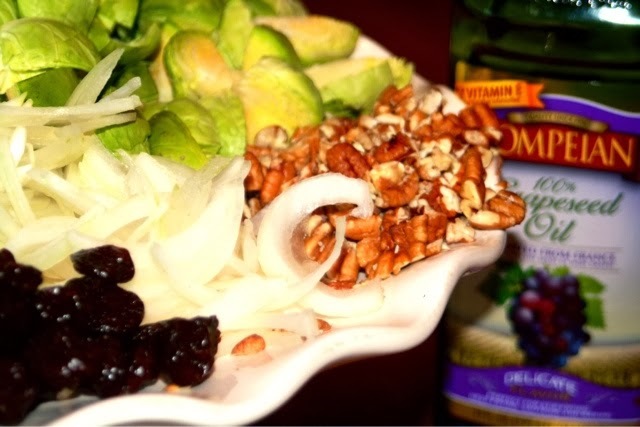 Toss the sprouts, onions and pecans with your oil. I keep my pecans in the freezer, but if yours are room temperature, you may want to wait and add them in with the cherries. A note about oil. . . I’ve been reading some recently about the best oils for roasting since seeing several articles about olive oil breaking down and becoming carcinogenic at high temperatures. I’m definitely no expert, but olive oil does have a low smoking point and is seen as a finishing oil in Italy, so it doesn’t make a lot of sense as an oil for roasting. I do a lot of cooking with coconut oil, but it also has a very low smoking point so doesn’t make a lot of sense either. Avocado, grapeseed and good old canola all have high smoking points, so I leave it to you to weigh any health/GMO concerns against cost. I’m using grapeseed oil. 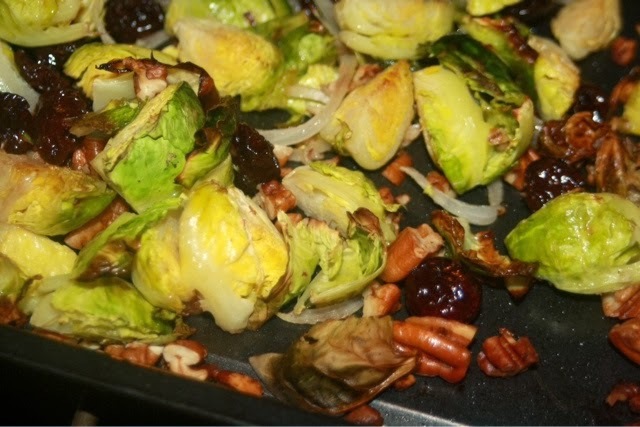 Put sprouts, onions, and pecans in your (preferably metal) roasting pan and cook at 475 for 10 minutes. Then stir and mix in cherries (an pecans if they were at room temperature). Roast for another 5-7 minutes until sprouts and onions are nicely browned. Salt and pepper to taste and enjoy. 2. 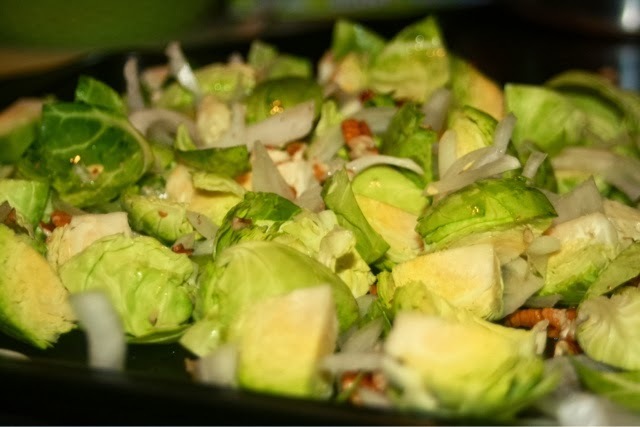 Toss trimmed and quartered Brussels sprouts, pecans and onions with oil to coat in roasting pan. 3. Roast for 10 minutes, then stir and add cherries. Roast 5-7 more minutes until cut sides of sprouts are browned. 4. Remove from oven. Salt and pepper to taste.